Click on the album title above to head directly to the relevant review. 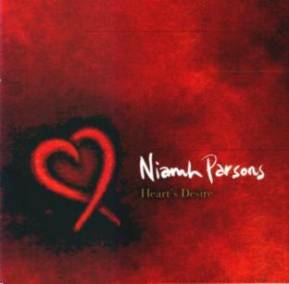 Releasing three albums in a mere three years would test any singer's mettle and so it proves with Dublin-born Niamh Parsons' Heart's Desire. However, this is not simply another solo album to follow 1999's ground-breaking Blackbirds and Thrushes and the succeeding year's consolidation via In My Prime, since tucked away on the tray insert, just below the singer's name, is the simple phrase "with Graham Dunne". Presumably, contractual reasons preclude the appearance of Niamh's regular musical partner from greater prominence, but this brief mention is hardly fitting, considering the guitarist appears on nine of the album's fourteen tracks. Indeed, Graham, takes the leading role on two of these (where Niamh does not appear at all) picking his way adroitly through sets of reels and jigs respectively while himself accompanied by Dennis Cahill, the album's producer (and fiddler Martin Hayes's regular sparring partner), on nylon-strung guitar and mandolin. Niamh, of course, is one of the most eloquent unaccompanied singers around, though some die-hard traditionalists might take issue with occasional evidence of the jazzy ornamentations she displayed with her former band The Loose Connections. There are three solo renditions on offer here, including the very familiar My Lagan Love into which Niamh breathes her customary vitality, but the best of these is a relatively new song, New Holland Grove, penned by the County Armagh songwriter Seán Mone, renowned for his comic song My Name is David Trimble. Dunne offers understated excellence whenever he appears, but two of the standout songs feature radiant accompaniment from the Clare button accordionist Josephine Marsh, the jaunty A Kiss in the Morning Early and the more reflective Tide Full In. While lacking the overall strength of Blackbirds and Thrushes, this is still an album which will delight Niamh's fans, but whether it will add new converts is questionable. Is there a better female song interpreter in Ireland at present than Niamh Parsons? On the evidence of The Old Simplicity it’s truly hard to believe otherwise. Indeed it’s possible to avow that Niamh hasn’t just stepped into Dolores Keane’s shoes, but reached for the old expanders and taken her tootsies down lanes which others might fear to wander. Yet, there’s a qualification required since probably no Irish traditional singer has ever surpassed the innate joy present in Dolores’s singing while Niamh’s work, as the funereal cover suggests, dwells in a far more sombre land. So, no matter how mellifluous her vocals, her choice of material leans heavily towards the dark side of experience. So, if you’re seeking rapture or rousing choruses, look away now. Most of the songs on The Old Simplicity are indubitably bleak and the titles of some give the game away – The Men That God Made Mad, Blue Murder, He Fades Away, No Telling and Poor Irish Stranger. True, there’s the occasional joyful interlude, usually provided by Graham Dunne’s solo guitar tracks, but even the traditional Ye Rambling Boys of Pleasure seems to drag the listener inexorably towards the abyss. 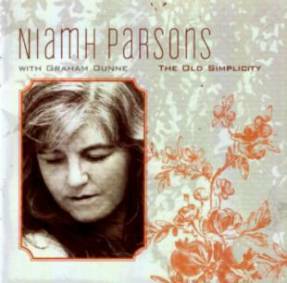 Overall, The Old Simplicity is Irish traditional music’s version of Nick Cave’s Murder Ballads. You’ll be swept along by Niamh’s luxuriant voice, but the omnipresent negativity might ultimately seem enervating. These reviews by Geoff Wallis were originally written for Songlines magazine – www.songlines.co.uk.